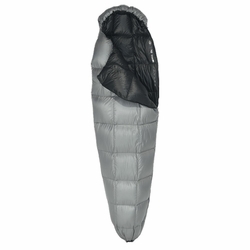 If you require a sub-zero warmth sleeping bag in the smallest possible size the Sea to Summit Mc III is your bag. The Micro series are our lightest weight bags, fully-featured and filled with 850+ Loft Eastern European Goose Down. These bags incorporate our 2D NanoShell™ providing the lightest most breathable water resistant shell. Form fitting, the Micro series uses a 55/45 fill ratio to insulate your core as the bag rotates with you throughout the night. A security pocket located inside the bag is easily accessible, ideal for stowing electronics to preserve battery performance in cold conditions. The soft touch lining fabric is down proof by construction and highly breathable offering a comfortable sleep. The Micro series is our choice for cycle touring across the Pyrenees, adventure travel on the Inca trail in South America and fast & light backpacking in the Sierras.